Buying card making supplies can be quite confusing since more card-making materials are being introduced into the craft and scrapbooking stores. Here's a list that will help you make smart choices. You will also be able to download free printable paper below to print and use in your handmade cards. Actually, the cardmaking supplies listed here are things most people have at hand around the house. So do not run out and spend money before looking around. If you are a scrapbooker, you will find these in your scrapbooking supplies. 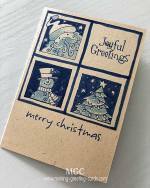 Look around the house, especially in your children's rooms and I'm sure you can find something that you can use to make your own greeting cards. 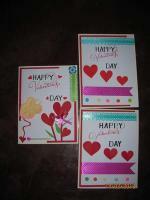 I have listed the most basic cardmaking materials here. Just click on each card making supplies and you will be directed to a page that gives a more detailed explanation on each craft tool. 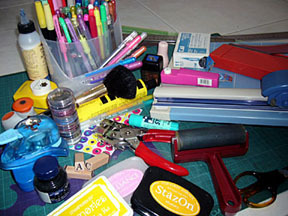 If possible, images are included for some of these card making tools and supplies. So browse and see if you have any of these already in your possession. Then make a note of those you do not yet have and ask your children whether they own any of these. Tick off those you believe you won't need at the moment. Then armed with your final list of card making supplies, you are ready to go shopping. Be aware though that when you walk into the craft store, you just might find yourself adding more items to your shopping cart than those in your list. Keep reminding yourself that you don't need everything. And the craft store will still be there anyway if you missed out something necessary for your card making project. Nowadays, envelopes come in many different sizes and color. I like to make cards that can fit into a standard size envelope but there are occasions when I felt more creative..
click here to read more about ink and inkpads. click here to read more about punches. Stencils are design templates made of metal (brass) or plastic and are usually laser cut with simple to fine details designs. 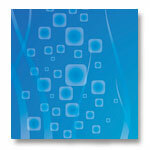 You can use these to beautiful embossed designs on your cards. click here to read more about embellishments. click here to find out more about rubber stamping and supplies used. 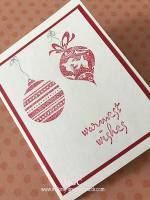 Beside these basic materials, you might like to slowly and gradually add other card making supplies to your collection for more advanced cardmaking. 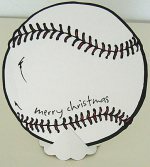 Check out the card-making shop for more printable paper, die cuts and other available supplies.